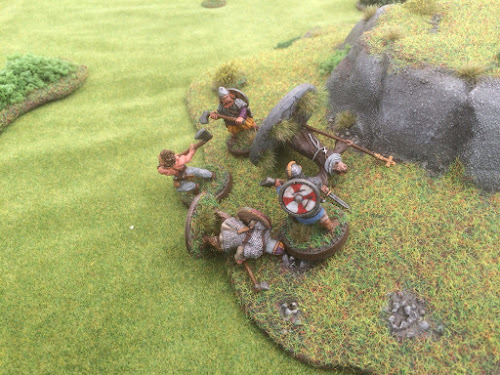 Harold's Revenge: Blood Eagle - Get to the Ships! 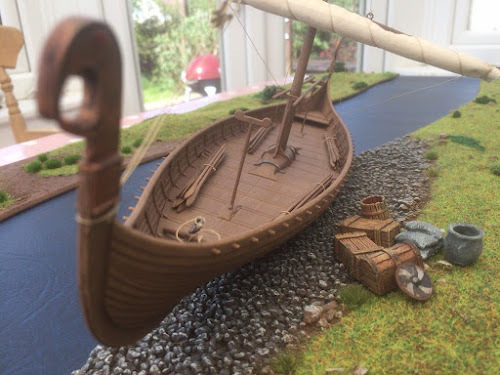 Blood Eagle - Get to the Ships! "But Sire!" cried the Priest, "The host has been assembled and moves with all speed to destroy the pagan invaders." "I know that!" grumbled Wulfestan, "But they are still too far away. The Northmen will have sailed into the distance by the time the fyrd arrives. We must cut off their escape." Johan emerged from the marshes and scanned the riverbank. Ahead lay his longship. Despite the misfortune in the forest, this season's raid had been successful. 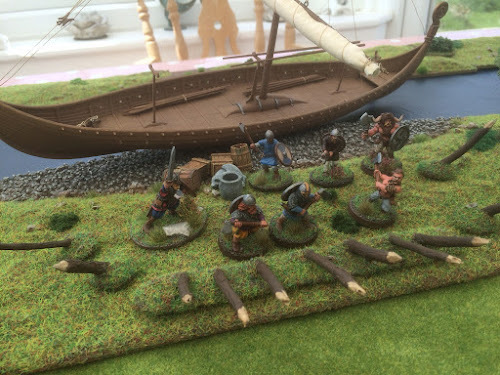 Crates, barrels and assorted plunder lay stacked next to his ship. 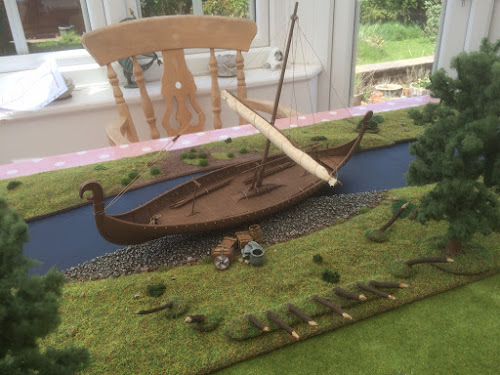 His was the last longboat to depart. There would be much feasting and drinking in the Great Hall during the long winter nights to come. Squinting against the bright sunshine, Johan raises his hand and his men halt. "It appears our friends intend to wish us fair thee well on our long voyage!" laughs Johan. Grinning, he turns to his men and raises his sword. 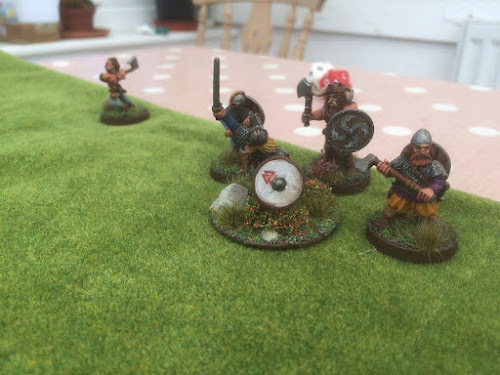 Before his mouth had closed, Ulf the berserker rushed forward, brandishing his mighty axe and bellowing words that not even the Norsemen understood. 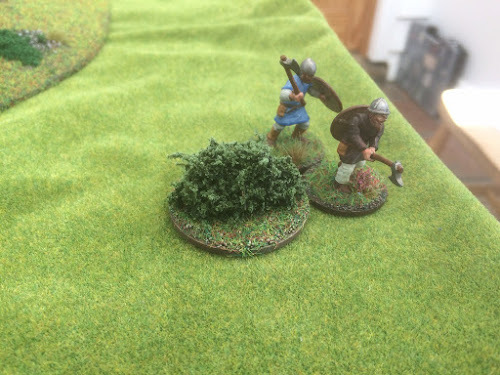 Meanwhile, Wulfestan looked on with grim determination. "See how the pagans run to their ship Sigered? This day will be ours." Anticipating that the Norse would skirt around both sides of the hill, Wulfestan beckoned to a warrior and skirmisher. 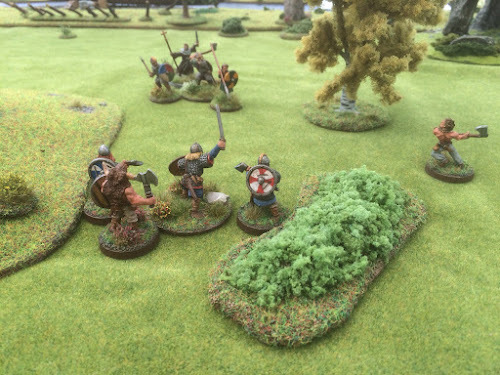 The two Saxons saw the danger and ran to meet it. 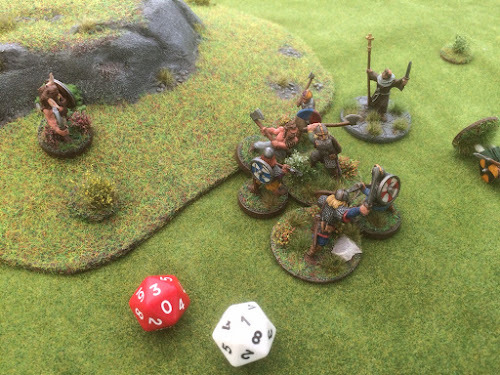 A stone flew from the skirmisher's sling, but sailed harmlessly over a Norse warrior's head. 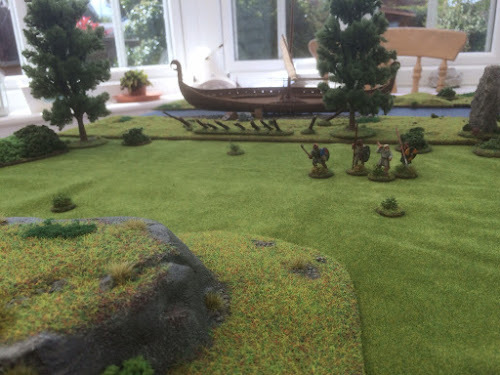 The Norse warrior and his companion slung their shields and ran towards their ship. 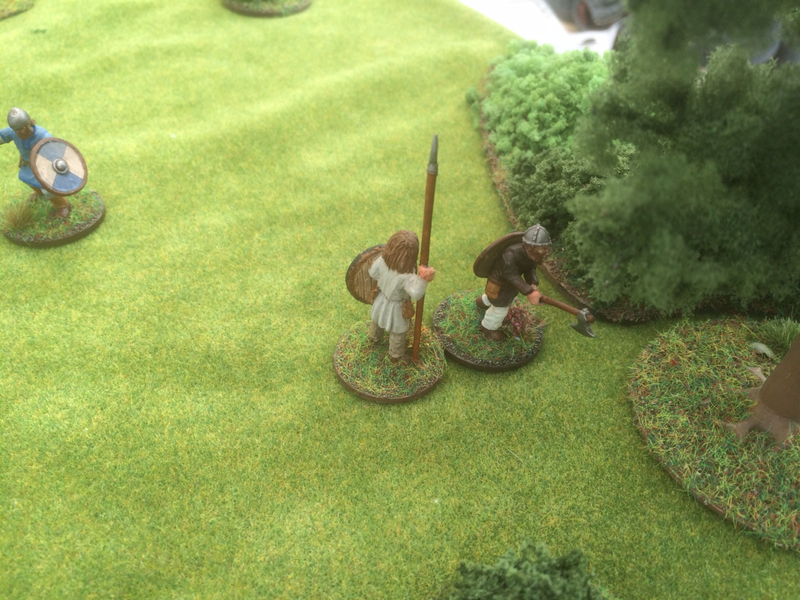 But before they can find cover in the scrub bordering the river, a Saxon warrior charges forwards with his spear. 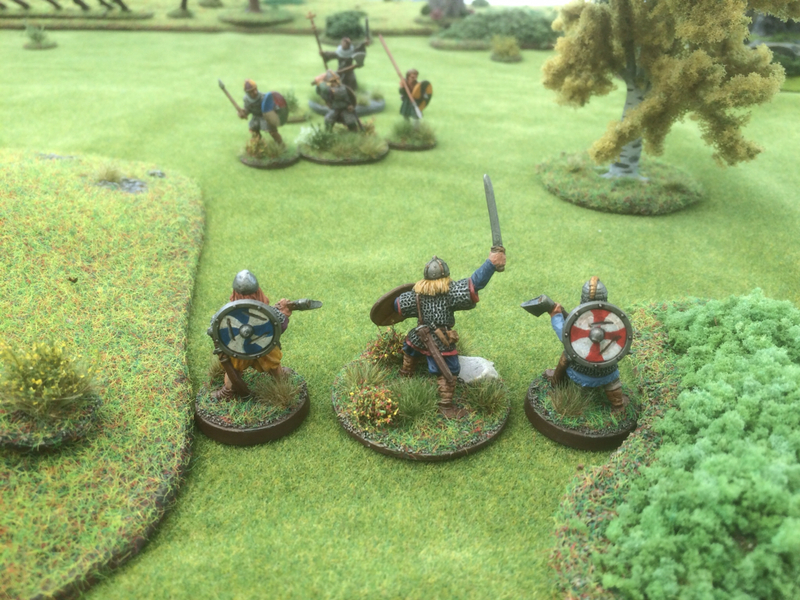 Meanwhile, Johan and his two veterans advance towards the Saxon Thegn. 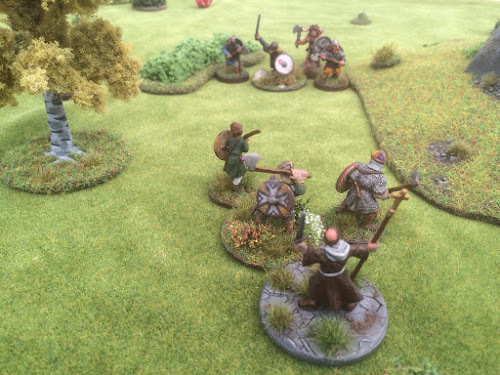 Wulfestan beckons to his priest. "Keep close Sigered! We will be calling on your blessings this day!" Johan looks to his right and slowly shakes his head. Wulfestan raises his axe and cries "With me!" 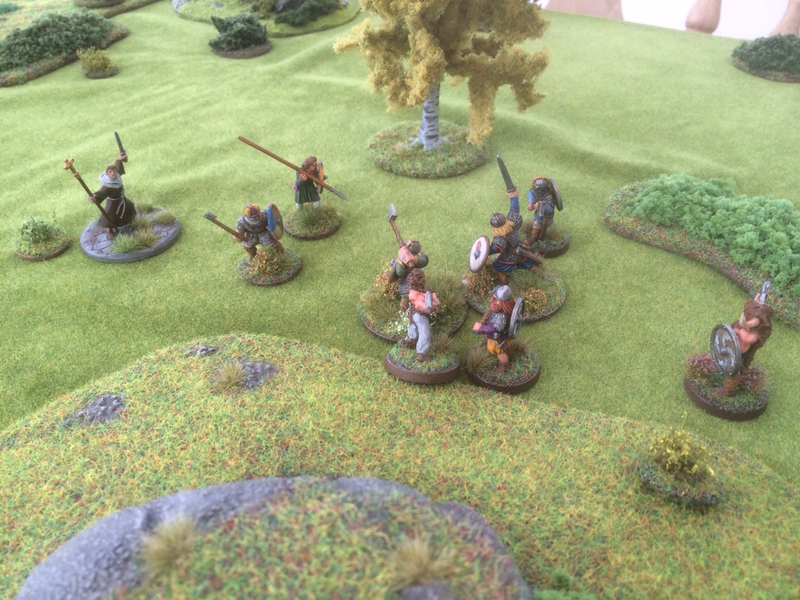 But Johan stands his ground. 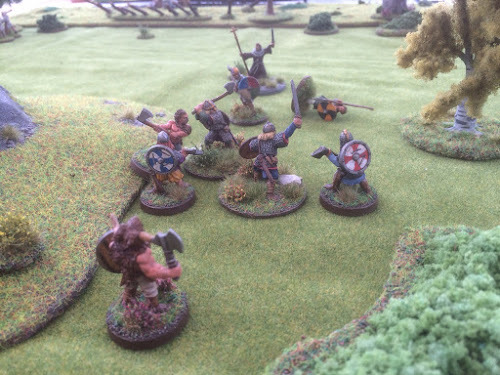 The berserker appeared to be charging the hill, but at the last moment he changes course and runs at the Saxon Thegn. Vandil, the hero of the Fateful Bridge, steps forward. Taking aim he hurls a throwing axe. 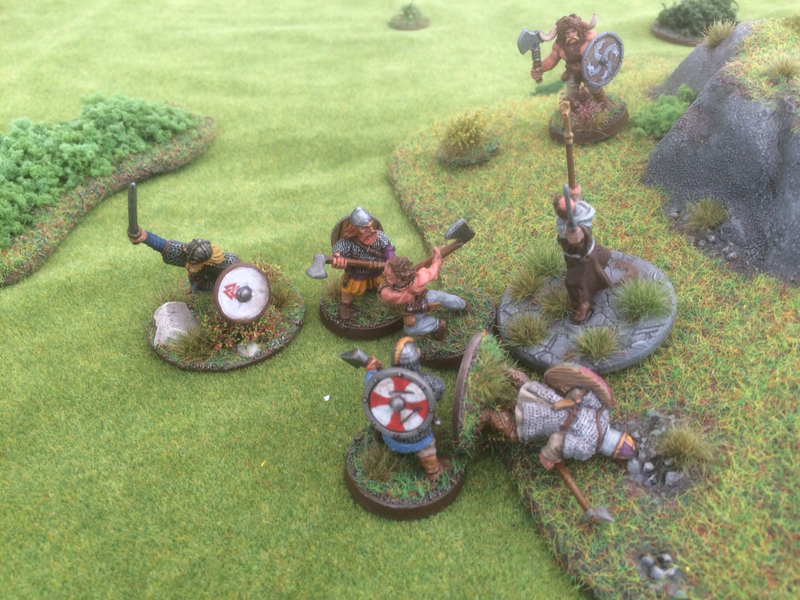 Distracted by the sight of a half naked Norsemen crashing into his Thegn, the Saxon warrior is oblivious to the rotating axe - until it embeds itself into his skull. The spearman crumples to the ground, dead. 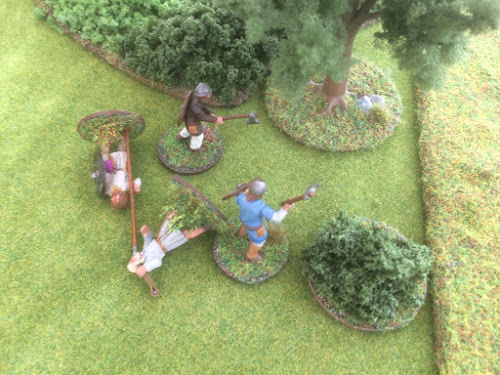 On the far side of the ship, the skirmisher could find no clear target for his sling. Drawing his club he charges. Without even pausing for breath, the Norse warrior swings his axe. Blood spurts over his shield as the Saxon spearman falls to the ground. 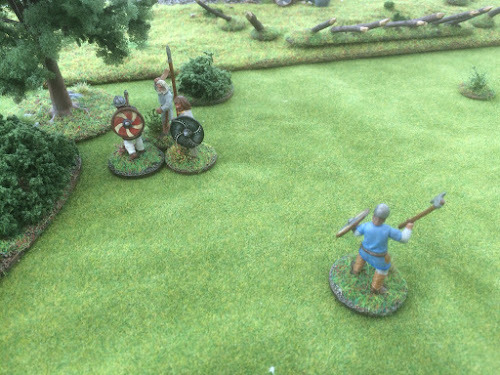 Before the Saxon skirmisher can even raise his club, a second Norse warrior hacks him to the ground. Ox, climbs up the side of the hill. Despite his bellows reverberating against the rocks, his form does not change. 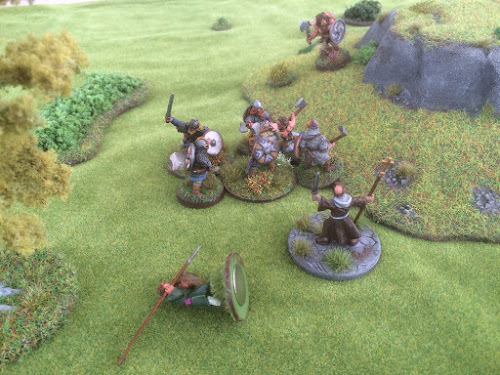 Ulf and the veteran warriors throw themselves at Wulfestan. The berserker raises his axe and seeing the Saxon Thegn mobbed by his companions, he brings it down - hard. Of course, Blessings count for nothing when the pagan gods are against you! Yet another Saxon helm is burst. But what of the skull within? 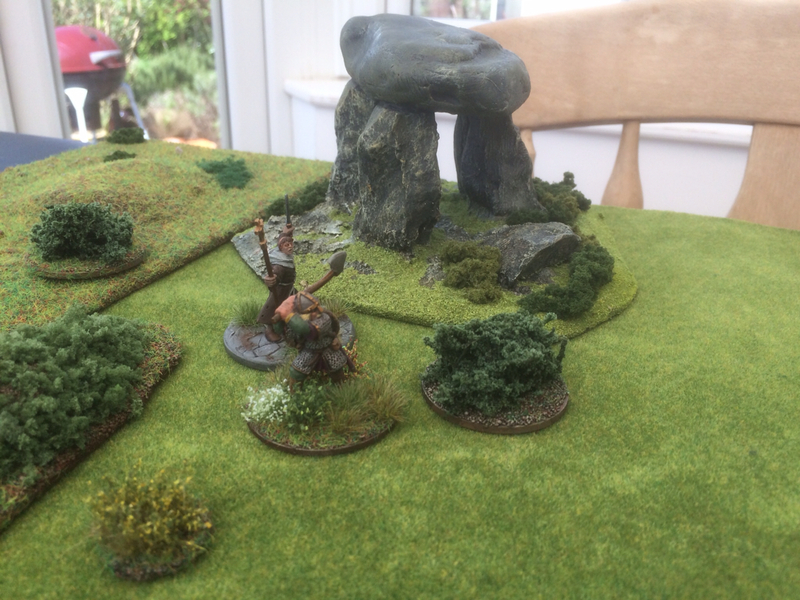 Vandil sees his bridge adversary stood before him. 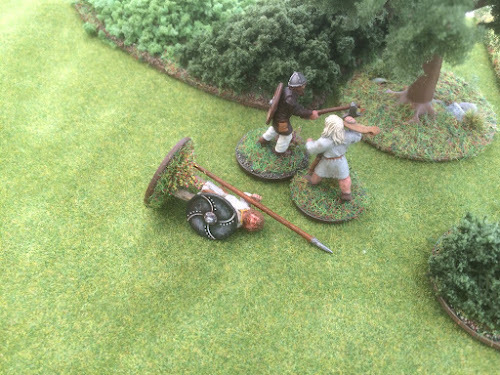 Distraught at the loss of his Thegn, Aldwyn stumbles and Vandil's axe cuts him down. "Be gone you pagan fiends!" shouts Sigered. 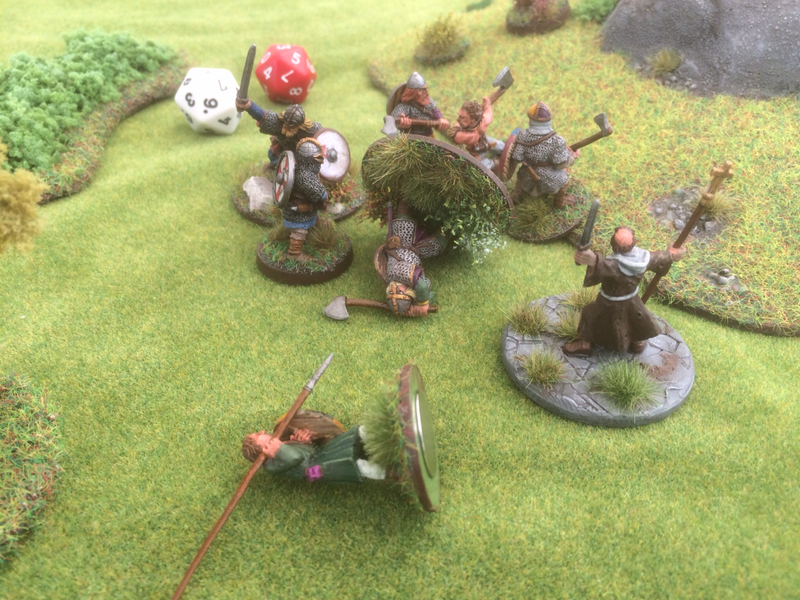 Valiantly whirling his quarterstaff, the priest staggers as a glancing blow knocks him to the ground. 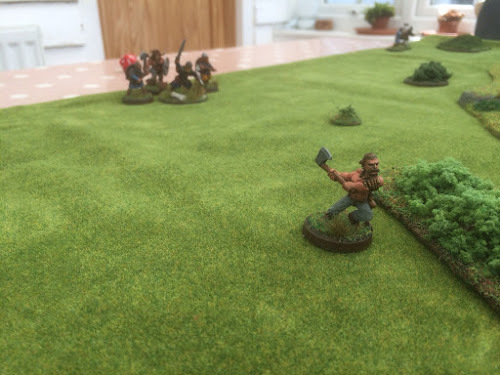 Unable to find his feet, the priest looks upwards and as the axes hack at his prone body, he finds his God. Johan kicks at the shape before him. "This one will fetch a good price!" As the Norse gather their plunder and start loading their ship Wulfestan winces at the bonds that cut into his flesh. "You may have our silver" he mutters, "but vengeance? 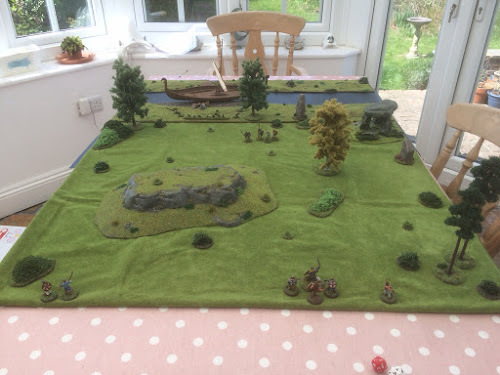 Vengeance will be mine..."
A fabulous report, the table top looks great. 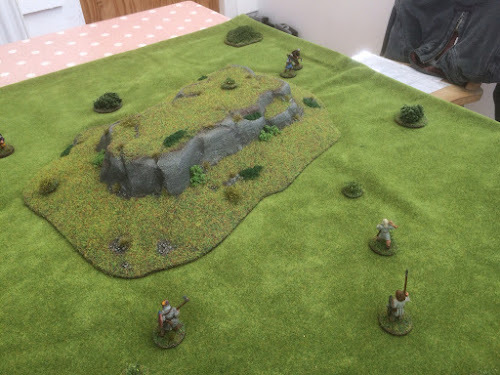 Very nice battle report as usual Lee! Well written :) loved it. The Vikings did really well this game! Poor Wulfestan, he's not very lucky is he! A bit of a bloodbath for the poor old Saxons. Great stuff once again! Shall be having a game ourselves this afternoon!